There are a lot of YouTube creators who produce videos on Indian cuisine. 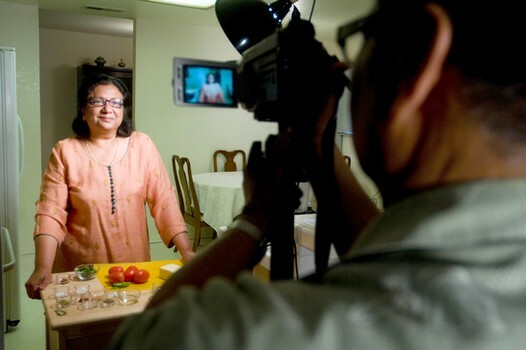 But if there’s one name that resonates with all the audience – it’s Manjula’s Kitchen. Everyone I’ve talked to about Manjula’s Kitchen replies ‘Oh yes, my wife follows her channel’ or ‘Yeah, we even made Pani Puri at home! Thanks to Manjula aunty.’ etc. And guess who got lucky to talk to the YouTube star herself and get to know her story? 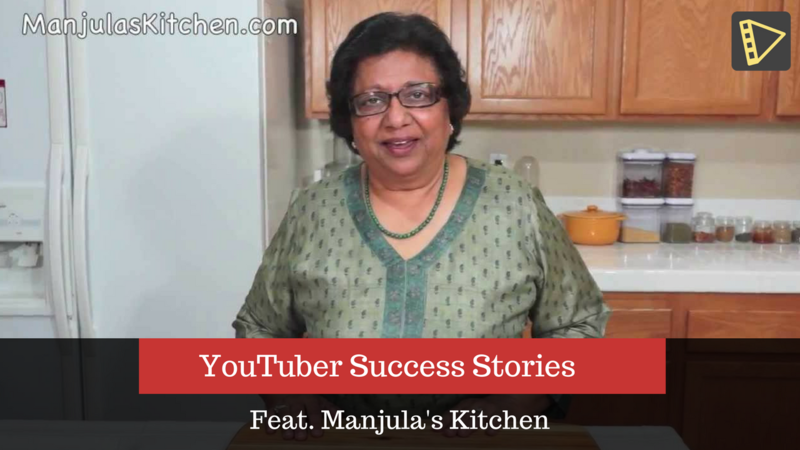 Welcome to the first part of our YouTube Success Stories exclusive with Manjula Jain. Q: I think there’s at least 1 person in every online family in India that follows you, not to mention the following in US, Europe and other parts of the world. How do you enjoy this YouTube celebrity status? Manjula: I enjoy it, and I am happily surprised that people like my videos so much. I love when people come up to me to say how much I have helped them in cooking. What surprises me the most is that I hear that more from young men than women. It makes me feel good and I feel I’m doing something right. Q: You are one of the early adopters of video blogging recipes on YouTube having started in 2006. What made you pursue video blogging on YouTube? What are the factors that kept pushing you to be disciplined and consistent in producing videos? Manjula: I pursued video blogging as a hobby which my family supported and my main goal throughout has been to help the younger generation. I was inspired to be consistent due to the feedback I got about how my videos were helping people and therefore I continued trying to make recipes easy to follow giving them some of my twist, and making content that my viewers would hopefully find useful. Q: You’ve seen YouTube grow from a small video content startup to the mammoth social video platform that it is today. How has the 10-year journey with Youtube been? Manjula: My journey has been fun and educational. I started from nothing and to see the growth I have made in my videos and my cooking has been quite amazing. YouTube has given me a lot and I am very grateful for it. Q: You have built a huge subscriber base on YouTube (400K subscribers). How do you engage with your fans and followers? What social platforms do you use? Manjula: I engage with my fans and followers by answering their questions and reading their suggestions through my Facebook page, my website and especially on my YouTube comments. I try out any suggestions I am given to improve my recipes. I will be starting up the contests on my website again in order to better engage the audience because I felt like I was missing out on having a better connection with my viewers. Q: How do you decide your content calendar – what to prepare? Do you take inputs and requests from your followers? How do you schedule your shoots – one at a time or two-three episodes together? Manjula: There is no method to my content calendar. It is dependent on what recipes I have been working on at the time and what I have been inspired by. I do take inputs and requests from my followers which also affects what recipes I will be doing. I only make one video at a time because I spend many hours and I make the recipe multiple times in order to make it easier for my viewers to follow. Q: Everyone knows ‘Manjula Aunty’ well! Who are the people behind the scenes who push you day in and day out to keep doing great cooking videos? Manjula: I am blessed to have a family that completely supports me to make YouTube videos and they are the ones that pushed me to get started initially. Specially my husband Alex who shoots the videos, edits and finally posts on YouTube. My family members are my taste testers and I love the feeling I get when they tell me a recipe is ready to be posted. At the end of the day, my viewers are my ultimate motivation because without them, I would not have gotten as far as I have gotten today. Manjula: Rather than the funniest comment, I have had a few viewers make spoofs about my videos a few years ago, and it made my entire family laugh. The most inspiring comments I have seen are when people say that it feels like they are learning how to cook from their mom. I watch at random and don’t really watch a specific YouTuber. 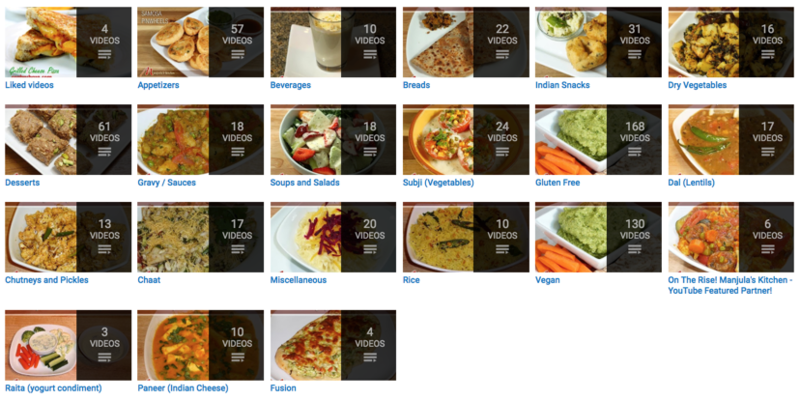 I am inspired by various videos and recipes that I find and I try to create a new version of it. Manjula says she’s got some exciting delicious Oriental-Indian fusion snacks waiting for us and we are mere mortals who can’t resist such temptations. But we are not done with the interview yet! Stay tuned to know what Manjula’s got to say about YouTube video making and yes, she’s got a special message for all YouTubers. Part II coming soon! Very informative and useful for new Creater like me.